RVO reported that white vapor emissions from Bamus were observed during 1000-1130 on 12 July. The emissions were forceful and slightly gray in color at 1110. The vapor plume drifted SSE. According to the Papua New Guinea Department of Mining (DOM), reports coming from Bialla Local Level Government (LLG) indicated that Bamus showed signs of unusual activity. At 1010 on 12 July 2006 observers saw white vapor coming out at the summit. The emission was forceful at about 1110 that day, with a tint of gray color in the emission. The vapor-rich plume blew inland to the SSE. No ashfall was reported. Officials from Bialla LLG together with a DOM observer witnessed the activity, as did Max Benjamin from Walindi Resort (~ 40-50 km away). Benjamin called the Rabaul Volcano Observatory to report the activity. No satellite-detected thermal anomalies at the volcano were reported by the MODIS website for this time frame. Information Contacts: Steve Saunders and Herman Patia, Rabaul Volcanological Observatory (RVO), Department of Mining, Private Mail Bag, Port Moresby Post Office, National Capitol District, Papua, New Guinea. "Strong seismicity took place near Bamus during February. The seismicity started on the 2nd when almost 100 events were recorded (maximum ML 5.8 [but see 15:3]). In the following days the activity waned, but began to increase on the 8th. Seismicity peaked between the 10th and the 15th, when ~1,400 events were recorded, including three earthquakes of M 5.8-6.0. Activity declined irregularly during the following 10 days, but began increasing again on the 25th. During the second peak of activity, between the 25th and the 28th, ~880 events were recorded including two earthquakes of M 5.0. Activity declined again at the end of the month. "Inspections of Bamus were carried out on 13 and 16 February. Rockfalls had occurred at many places on the volcano, apparently associated with the seismicity. Temperatures in solfataric areas on the summit tholoid remained low (<15°C) however. A temporary seismograph network, operated in the area between 13 and 16 February, enabled locations of some earthquakes to be calculated. Epicenters were distributed in a 10-km-long NNE-trending zone that included the S flanks of Bamus. Focal depths ranged between 0 and 23 km. The seismicity was continuing in early March and was being monitored primarily by the permanent seismograph at Ulawun Volcano." "Seismicity. . . continued throughout March, although at a milder level after the 5th. Following intense February seismicity that involved 83 earthquakes of ML >=4.0, eight of ML >=5.0, and one of ML >=6.0, activity was strong again 3-5 March. More than 720 earthquakes (two of ML = 5.0-5.1 and 10 of ML >=4.5) were recorded before seismicity decreased to 20-50 events/day of small-moderate magnitude. The energy released by the February-March seismicity was relatively large, 1.22 x 1021 ergs (figure 1). Figure 1. Daily number of earthquakes (bars) and cumulative energy release (circles) near Bamus, February-March 1990. Magnitudes (ML) of larger events are given over earthquake count bars. Courtesy of RVO. "An inspection of the Bamus area was carried out on 6 March. Rockfalls had occurred at many places on the volcano and in the limestone ranges to the S. However, no change was observed in the temperatures of the solfataric areas on the summit tholoid (which remained at <=15°C). "Temporary seismograph networks were operated in the area 13-16 February and 6-8 March. Earthquake locations defined a broad 15-km-long seismic zone trending NNE that extended from the Nakanai Mountains to the S flank of Bamus (figure 2). Within this zone was a concentration of locations trending ENE near the S foot of Bamus. Earthquake focal depths ranged from 0 to 23 km. Figure 2. Epicenters of seismic events at Bamus, 13-16 February and 6-8 March 1990. Courtesy of RVO. "Cross-sections . . . (figure 3) suggest that the main cluster of earthquakes defines an ENE-trending near-vertical fault. This orientation is consistent with the structural pattern evident in the Miocene limestone immediately S of, and underlying, Bamus. Figure 3. Focal depths of seismic events near Bamus during 13-16 February and 6-8 March 1990 projected along lines A-B (top) and A-C (bottom). Horizontal scale (and thus vertical exaggeration) changes from A-B to A-C. Courtesy of RVO. "The cause of this seismicity remains uncertain. Its ongoing fluctuating character, and the fact that its swarms include but do not occur in response to larger earthquakes, could be consistent with magmatic injection. On the other hand, ML 5-6 earthquakes are uncommon for magmatic events. Analysis of the magnitude/frequency distribution of the earthquakes shows that the 'b' value is ~1, which is indicative of tectonic earthquake sequences. The seismicity was continuing in early April and was being monitored primarily by the permananent seismograph at Ulawun." "Seismic activity . . . decreased markedly in April. Following a period of intense activity in early March, the frequency of occurrence and magnitude of earthquakes decreased gradually, with only 27 events of ML >=3 recorded in April (from a total of 200 events picked up by the Ulawun station, 25 km away). Event frequency ranged between 2 and 7/day. Two isolated earthquakes of ML 5.6 and 4.2 occurred on the 26th." Information Contacts: P. de Saint-Ours, and C. McKee, RVO. "Seismic activity from near the southern foot of Bamus virtually died out in May. There were only 97 events recorded, of which 15 were of ML >=3 (largest event, ML 3.8)." Symmetrical 2248-m-high Bamus volcano, also referred to locally as the South Son, is located SW of Ulawun volcano, known as the Father. These two volcanoes are the highest in the 1000-km-long Bismarck volcanic arc. The andesitic stratovolcano is draped by rainforest and contains a breached summit crater filled with a lava dome. A satellitic cone is located on the southern flank, and a prominent 1.5-km-wide crater with two small adjacent cones is situated halfway up the SE flank. Young pyroclastic-flow deposits are found on the volcano's flanks, and villagers describe an eruption that took place during the late 19th century. Johnson R W, Macnab R P, Arculus R J, Ryburn R J, Cooke R J S, 1983. Bamus volcano, New Guinea: dormant neighbour of Ulawun, and magnesian-andesite locality. Geol Rundschau, 72: 207-237. There is no Deformation History data available for Bamus. There is no Emissions History data available for Bamus. 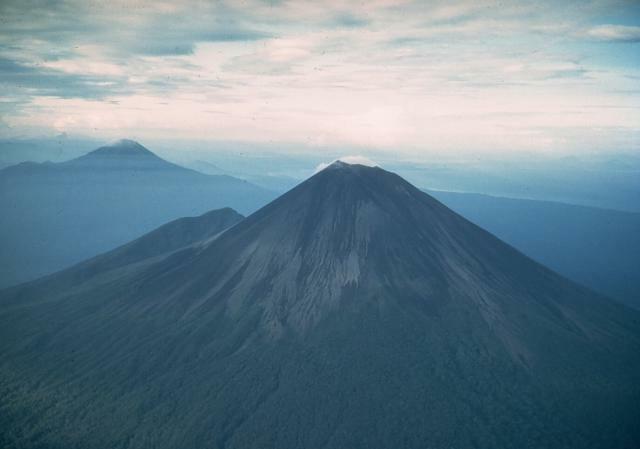 The symmetrical basaltic and andesitic Ulawun stratovolcano is one of Papua New Guinea's most frequently active. 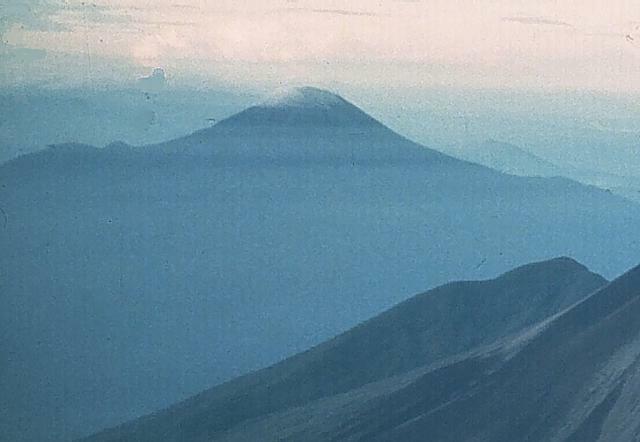 Ulawun and Bamus volcano (upper left) are the two highest volcanoes of the Bismarck arc, and are known as the Father and South Son volcanoes, respectively. The upper 1000 m of the 2334-m-high Ulawun is unvegetated. The peak to the left of the summit is a prominent E-W-trending escarpment on the south side that may result from large-scale slumping. Historical eruptions date back to the beginning of the 18th century. Photo by Wally Johnson (Australia Bureau of Mineral Resources). Symmetrical 2248-m-high Bamus volcano, also referred to as South Son, is seen here from the NE beyond the upper slopes of Ulawun volcano, known as the Father. These two volcanoes are the highest in the 1000-km-long Bismarck volcanic arc. Bamus stratovolcano is draped by rainforest and contains a breached summit crater filled with a lava dome. A satellitic cone is located on the southern flank, and a prominent 1.5-km-wide crater with two small adjacent cones is situated halfway up the SE flank. There are no samples for Bamus in the Smithsonian's NMNH Department of Mineral Sciences Rock and Ore collection. Large Eruptions of Bamus Information about large Quaternary eruptions (VEI >= 4) is cataloged in the Large Magnitude Explosive Volcanic Eruptions (LaMEVE) database of the Volcano Global Risk Identification and Analysis Project (VOGRIPA).